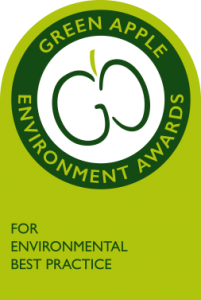 On Monday 12thNovember, at the 2018 International Green Apple awards for Environmental Best Practice held at the Houses of Parliament, the National Association for Environmental Education (NAEE) received a Gold award for its work in the education category. In particular this was in recognition of its project which provides bursaries to schools in Birmingham and the West Midlands. These allow young people to visit environmental study centres and link the visits with the development of environmental work across the curriculum. Known as Kenrick Days, the grant funding has been provided by the family of Hugh Kenrick, a noted environmental philanthropist from Birmingham. The award also cited the unique journal Environmental Education which NAEE has been publishing for over 50 years. “NAEE is very pleased to receive a prestigious Green Apple award. It is a recognition of the work we are doing to help young people and their teachers learn about the natural world and our place in it, and about the pressures we are placing on our planet by the way we live today. This is an important task and we look forward to continuing to work with schools and teachers and our supporters across the country. My thanks go to the very many people who have made this award possible by their dedicated enthusiasm, hard work and commitment”.